Get inspired and find a London Christmas party venue to hire with HeadBox. Organising the office Christmas party is a huge task. We’ve put together some of the best Spaces in London to get you started. Hire Florence Hall at RIBA for one of the best options for venue hire London has to offer! Hire The Arnold Hills at London Stadium for your next corporate event with a difference! Host your companies Christmas Party at Islington Metalworks for one of the best options for the festive season! For a truly unique London venue to hire for your next private dining event take a look around The Clubhouse at the Greenwich Yacht Club. Function Room Hire at Simmons | Clerkenwell is the best option for your next B2B events Space! Hire the Function Room at Simmons | Fulham for your next corporate event in London. The Soho Bar at The Groucho Club is an ideal private room hire in Soho, a truly buzzing area of London. You can hire the entire venue at the Fish Market for your next private party venue hire in London. Exclusively Hire the German Gymnasium for one of the best options for venue hire London has to offer! Take a look at our hand-picked collection of the best venues in London for Christmas drinks. Planning a festive celebration that everyone will enjoy is a daunting task. We've hand-picked 20 of our favourite venues for Christmas drinks with the team. Whether you're looking for swanky cocktail bars or cosy traditional pubs, we've got the perfect venue for your team on HeadBox. London is the land of opportunity and choice. With lots of venues to choose from it can be a daunting task. When it comes to the ultimate party season where all the venues are claiming to be the best it’s hard to know where to begin. We've put together some of the best options for venue hire in London so your office Christmas party can get off to a flying start. The pressure is on to find a venue that will please everyone, so we've got a huge range of options for you to choose from for 2019. Cool and quirky for the casual team get-together or sleek and chic for a corporate event. You'll find it all here! These party venues in London are the best of the best and are a sure way to kick start the holiday spirit. If it’s your turn in charge of hosting this year’s Christmas party it can be a daunting task. There’s lots of people to try and please and a strict budget to stick too. We’ve put together a guide of top things to consider when planning your Christmas party to help you through the process. Let’s get started shall we! 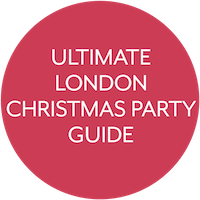 When it comes to Christmas parties in London there are plenty of options you can go for! Whether that’s a traditional private dining event or an unusual activity with your team, we’ve uncovered some of the best ideas the city has to offer to help you organise one of the best parties ever. So if this year is your year to organise the office christmas party then we’ve got the lowdown on some of the fun things you should do! Here are some work christmas party ideas that will keep your Guests happy. A classic option for a Christmas work party is to host a festive feast at one of London’s top private dining rooms. You can offer your Guests either a traditional Christmas roast or an alternative menu - accompany this with some of your favourite wine or cocktails and you’ll have some very merry Guests. Hosting a Christmas dinner party can be stressful but as long as you leave enough notice to get everything ready in plenty of time then it should be a breeze. Make sure you find a location that’s best suited for the majority of your guests and that all attendees can be catered for in terms of dietary requirements and facilities. Not all companies have a big budget to blow on a huge work Christmas party - and there are plenty of options for affordable festive venues that won’t break the bank. You could hire a semi-private area in a top London bar for some festive cocktails or think a little outside the box and go for a team activity rather than a party. We have plenty of fun team activities that you could do with your hardworking team to celebrate the beginning of the festive season - and then go to your local afterwards for a celebratory drink. Another option is to host a shared Christmas party - if you’re a fellow start-up from a co-working office Space then why not join forces and host one of London’s best shared Christmas parties where all the teams can join together for some festive fun! As well as saving a bit of money, there are lots of other benefits to hosting a shared Christmas party. You get to socialise with new people, as your new team will be will be part of a much bigger crowd of people all joining in the festive celebrations. You will also get to experience something you usually wouldn’t get to experience - if you’re coming from a small company you probably wouldn’t have the budget to host a huge themed party in one of the top London venues. But with a shared Christmas party you can treat your team to the lavish night that they deserve. Taking part in a shared party also takes a lot of the stress away of having to organise the Christmas do - all you have to do is book, pay and show up to a venue near you and they will take care of the rest. This year, why not try something a little different for your London Christmas party? If you want to wow your attendees why not hire an unusual party venue this year. We’ve uncovered some of the most unusual venues in London, so weather you want to sail along the River Thames with a glass of bubbly, rent a blank canvas warehouse for an evening of personalised festive fun or partake in a round or two of London’s craziest mini-golf course before a delicious catered meal - an unusual venue will make your event stand out from the crowd. If you’re still struggling for ideas of what to do for this year’s event then check out our HeadBox Guide to Christmas Party Venues for some inspiration. Now we've discussed the type of party you can go for let's get down to the most important things to consider when choosing the perfect Space this Christmas. Prime party dates are extremely competitive. Make sure you get in early to secure the perfect venue. Every year, there will be that one date that event planners all over London just can’t shift, as well as there being a prime date that everyone wants. So make sure you think about when you want your party to be. No one wants to go for a big festive night out on a Monday - so make sure you plan your Christmas party around the working week. You should consider that the closer you get to the 25th, some of your team may have booked the run up days off of work - send out a suggestion of dates to your team and go for the one with the most attendees so that as few people have to miss out as possible. Whenever you’re on the hunt for a venue to hire in London always have the needs of your Guests in mind. This idea is at its most important when looking for a Christmas party venue as it’s the one time of year that your whole team can let their hair down and celebrate their successes. If you’re thinking of a catered party then make sure you are aware of any dietary requirements or special facilities such as disabled access so that everyone feels comfortable. Most London venues will decorate their Space for Christmas which probably won’t be ready at the time of your site visit. So, ask the events team if they have any photos of the Space when it’s decorated for Christmas so you have a good idea of what the venue will look it by the time your event comes around. And if you want to add your own personal stamp on the venue? Be sure to ask if you’re allowed to bring in any of your own decorations as well. Get your Christmas crackers at the ready! For those who are hiring a blank canvas Space like a warehouse venue you will have free rein with the Space’s decor, which is always fun. Have a think about what you want in advance and work out the budget you can set aside for decorations - whether that’s over the top tinsel or a more sleek and sophisticated Christmas decor. For those hosting a large scale Christmas party, you should get thinking about what entertainment you want at the event. Will it be a singer, magician or burlesque dancer? Having a source of entertainment is always a good way of making sure everyone is having a good time at the party as well as breaking up the evening. Every Christmas the prices for London venue hire slowly but surely increase as venues need to accommodate for a lot more events than their average month. Make sure you have this in mind when planning your event as you may need to increase the budget slightly compared to the normal events you organise for your company. There are lots of things that might go into your office Christmas party budget. Along with the venue hire fees you will also have food, drinks and maybe even transportation to think about as well. And then any additional costs for decorations, party favours and final touches to the event which all need to be considered before saying yes to the venue. Holding the party in the office Your team spend far too much time in the office as it is and the last thing they will want to do is spend a night there too. Plus it means you’re in charge of the clean up! Which doesn’t sound very festive to us. An office will always be an office no matter how hard you try to decorate it with tacky tinsel and budget fairy lights, so try not to cut corners on the venue cost by hosting the it in the office. Hosting the event out of town Although hosting a big Christmas do out of town may seem like a good idea, sometimes it’s more of a hassle than it’s worth! Hiring an elegant country home for the evening may seem attractive but it adds extra organisational tasks on your to do list. You will have the added task of arranging travel and transport to and from the venue. It may also result in more of your team having to drive or leave early so they can catch the last train back from the middle of nowhere. And taxis back will be hideously expensive, whether you put them on the company card or make your guests pay for themselves. Leaving everything to the last minute You have all year to think about what you want to do for the festive season so don’t let November roll around before you start trying to make your plans a reality. All the good venues will be taken and all the prime dates will have been filled up since way back in September. Don’t expect any work to be done the day after Your hardworking team will probably not be as hardworking after one too many mulled wines, so maybe planning a Christmas event at the beginning of the week is a little unfair. Thursday’s and Friday’s are prime days of the week to host the festive party so get in early to secure one of these days. And be kind, maybe speak to the boss about getting a late start the next day so that everyone can let their hair down without worrying about that 6.00am alarm. Not daring to be different Some Christmas parties tend to mould into one big tinsel tangle of carol singing and reheated mince pies. This year think outside the box and don’t stick to tradition. Host a night that everyone will talk about! Good luck with your quest to organise the best Christmas Party your Guests have ever seen. Why not get started and browse our London venue hire collections for some more inspiration. If you’d like some more top venue tips, then head on over to our blog here.